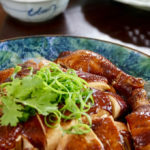 Disclosure: This recipe is proudly sponsored by Panasonic Singapore. 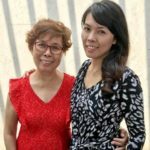 I had my first bowl of laksa when I was in primary three. My late dad had brought us to the Chinese Swimming Club. At the entrance was a very popular street hawker who sold piping hot laksa from his pushcart to a long queue of hungry customers! To me, it is still the best laksa that I have ever tasted! 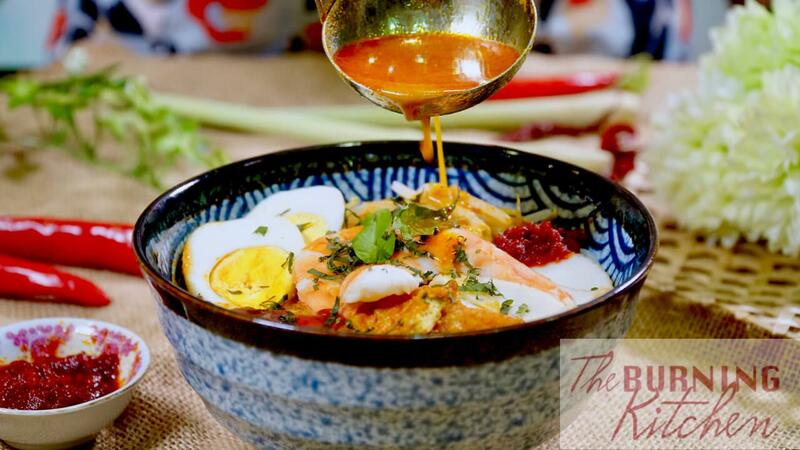 However I have not made laksa for a very long time because of how tedious and tiring it is to pound all the spices by hand to achieve the fine smooth texture of homemade laksa paste. 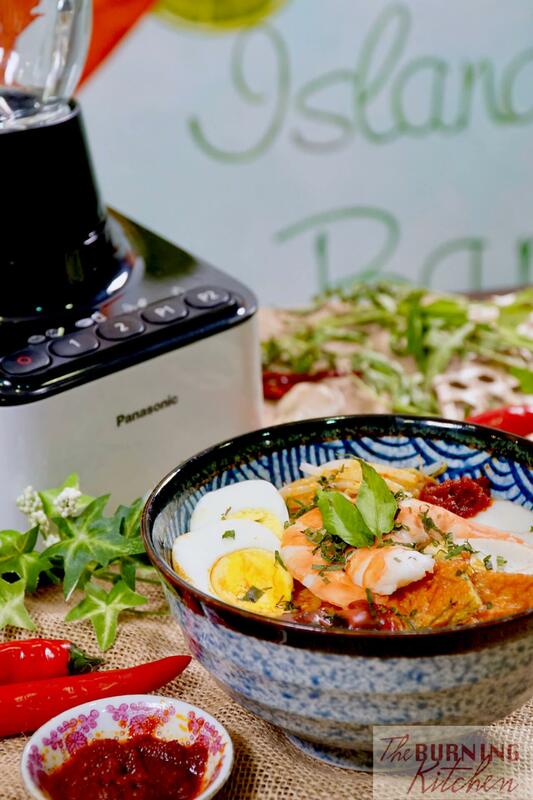 I had the inspiration to make Laksa today because I just received a brand new Panasonic MX-V310 blender, courtesy of our friends at Panasonic! I will let the blender do all the hard work for me in a matter of minutes, with just one press of a button! Want to know how was the outcome? Keep reading! 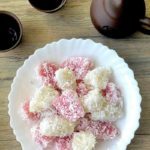 You can make a large batch of rempah, freeze them in smaller portions and voila! 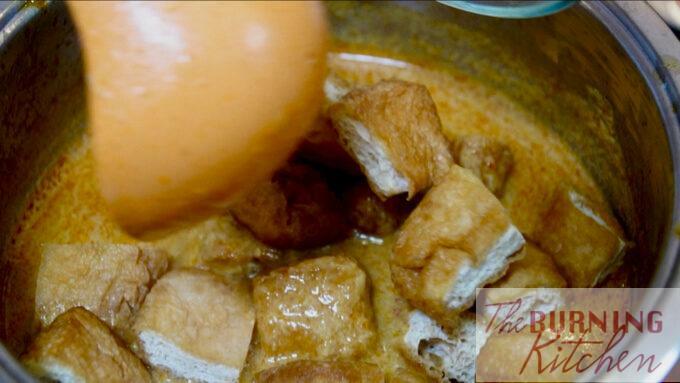 you have your very own supply of MSG-free, preservative-free instant Laksa Paste at your disposal anytime! Laksa keeps very well (and tastes even better!) overnight, so you can simply make a larger portion and tomorrow’s dinner is settled! Today I’m putting my new Panasonic blender through a rigorous test! Will it be able to blend my Laksa Rempah and Sambal Chilli spices to a fine and even consistency? Is it easy to use? And most importantly, is it easy to clean? Let’s find out! 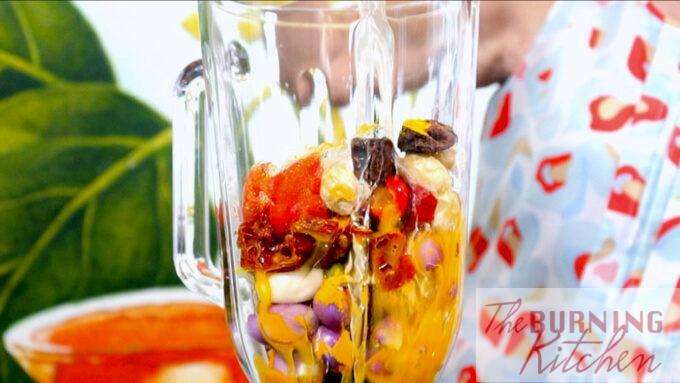 Made of durable thick glass – Before receiving this blender, I was hoping that it wouldn’t be made of plastic because I have had so many blenders made of plastic that I had to dump after a while due to discolouration. So imagine my delight when I unboxed my new ‘toy’ and saw that it was made of glass! 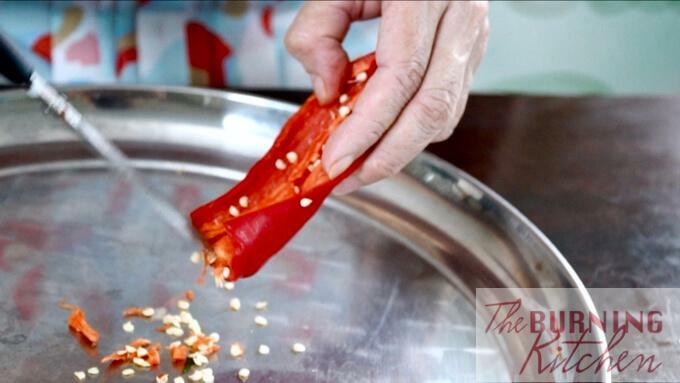 No more difficult stains and discolourations when I blend my chillis! On this point, the blender has my solid nod of approval! 6 Auto Menus to meet all your needs – This versatile blender has 6 specially designed auto menus for juices/smoothies, soups, ice crushing, baby food, pudding and nuts. 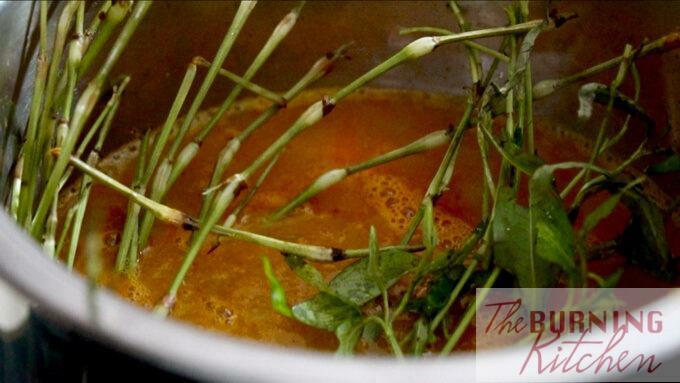 We used the Soup auto menu to blend the rempah with the shrimp water, and it worked great! Self-washing function – No more risking injury to your fingers when dislodging tiny bits of ingredients stuck at the bottom of the blade! After blending my rempah, all I had to do was fill the blender with 750ml of water, and press the ‘P2’ button for Cleaning. Within seconds, all the ingredients bits had dislodged themselves and only need a quick rinse with mild soapy water to clean and store. Easy peasy! Easy to clean and dry as the base of the blender is easily removable. 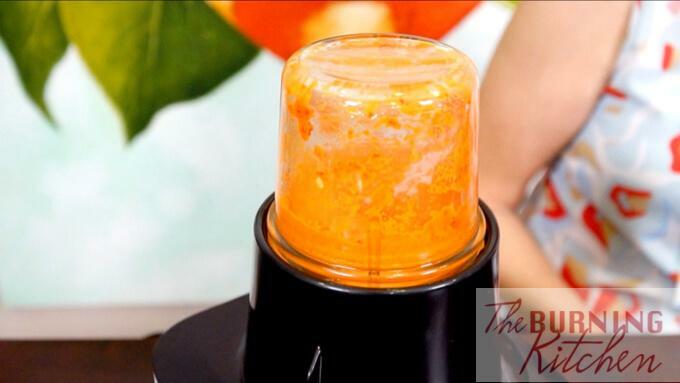 Powerful circulation using V&M technology – If you watch the video, you can actually see the ingredients being powerfully lifted and sucked into the central vortex where the blades are, ensuring that all the spices are thoroughly and evenly blended. 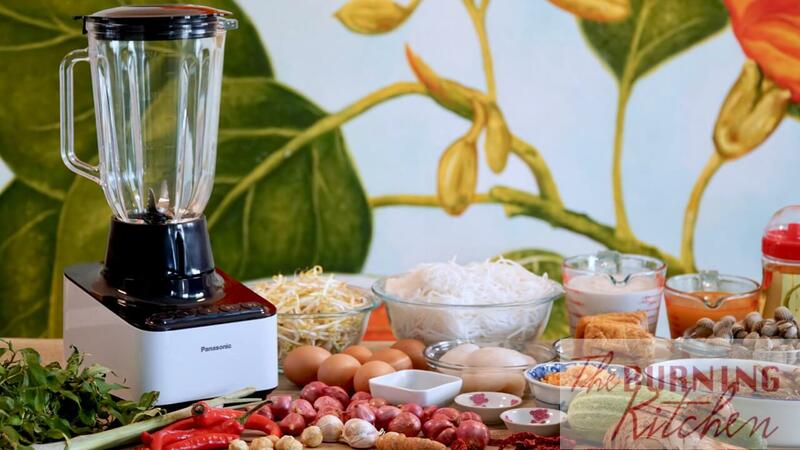 Powerful blade action – The blender is designed with upper and lower blades – the upper blades are supposed to crush the ingredients while the lower blades cut them finely. 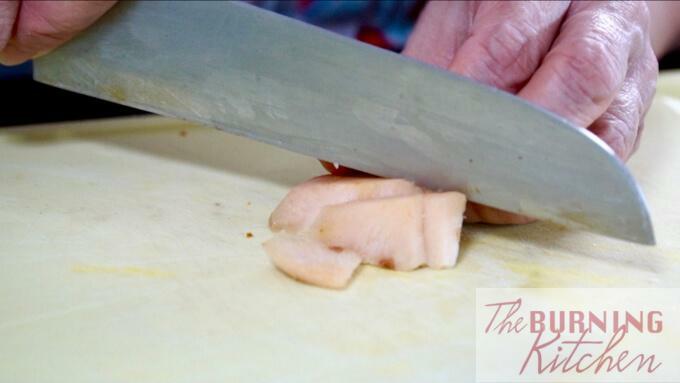 The cutting action is indeed powerful judging from how finely and evenly the dried shrimps and rempah were blended. 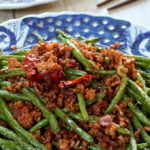 A note of caution, if you want your dried shrimp to be slightly coarser so it has more substance, be careful not to over-blend it until it becomes powdery! Mill is slightly small – While I love that there is a separate attachment available apart from the blender itself, I found the dry and wet mill on the small side. It would work well for the sambal chilli. But for the Laksa Paste, I used the blender attachment and added some prawn stock, as the blender does require some liquid to function smoothly. Ingredients in the mill got stuck a few times initially – Unlike the blender, which has upper and lower blades to circulate the ingredients for even blending, the mill has only one set of blades. This could be the reason why I needed to give it a few good shakes to help it along, but eventually the mill yielded a lovely fine consistency for my sambal chilli spices (get sambal chilli recipe here). 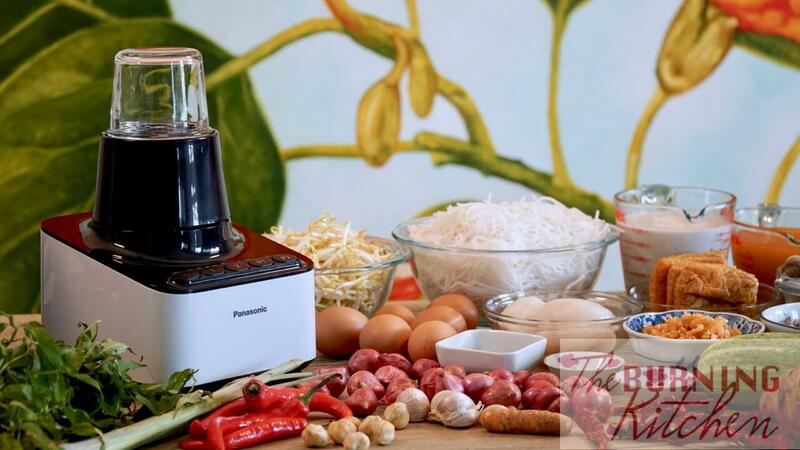 The Panasonic MX-V310 Blender retails in Singapore for S$109 and is available at all major departmental stores. You can check out the full product specs here! 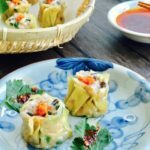 Wash the dried shrimp and soak in hot water until soft. De-seed the red chilli and cut into small pieces and set aside. 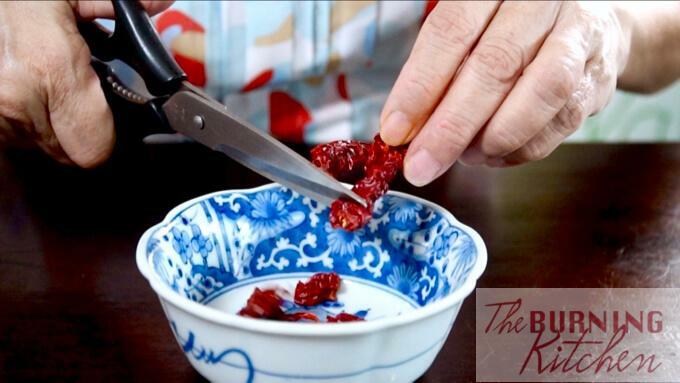 De-seed the dried chilli and cut into small pieces. Soak in hot water until soft. 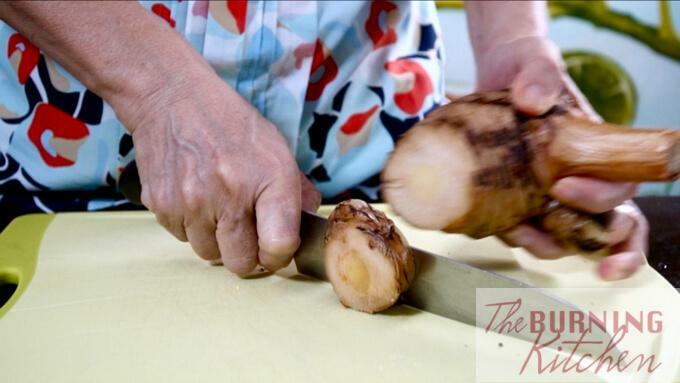 Remove the skin from the galangal, shallots and garlic. Toast a small piece of belachan and set aside. 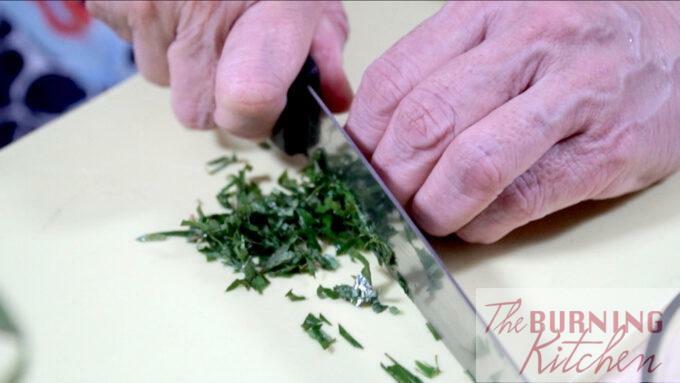 Rinse the laksa leaves and remove the leaves from the stalk. Cut the leaves into very fine strips. Keep the stalk for the gravy. Remove the roots from the bean sprouts. Rinse and drain. 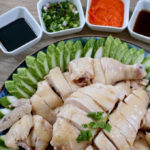 Wash the tau pok and squeeze dry. Cut into 4 pieces. Place cockles in a basin filled with water and 1/2 tsp of salt. Soak for 30 minutes to purge impurities. Discard water and wash cockles a few times to remove mud until water runs clear. Wash the prawns and set aside. 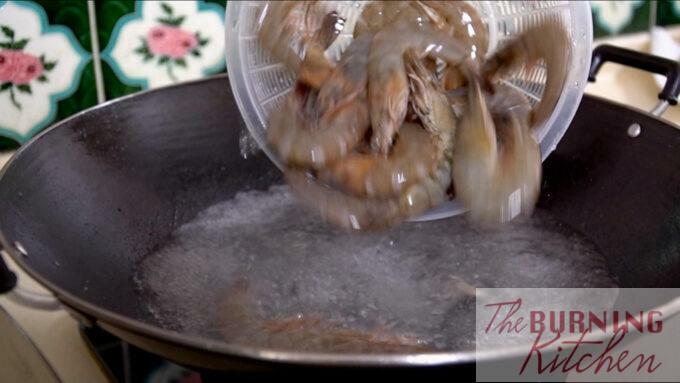 Place the rempah ingredients and shrimp water into the blender and blend finely. Transfer to a bowl. 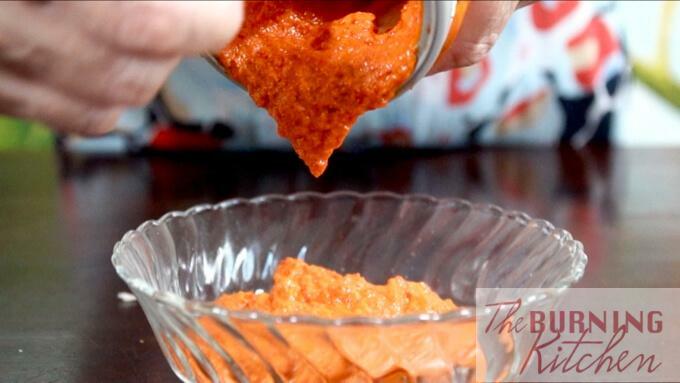 In the same blender, blend the dried shrimp finely and transfer to a bowl. Boil 500 ml of water, then cook the prawns over high heat for a few minutes until prawns turn red and “U” shaped. Remove prawns, and keep prawn water. Peel prawns. Set aside prawn heads and shells. In a wok, heat up 1 TBsp of oil. Add garlic and fry until aromatic. Then add prawn heads and shells and fry until aromatic and dry. 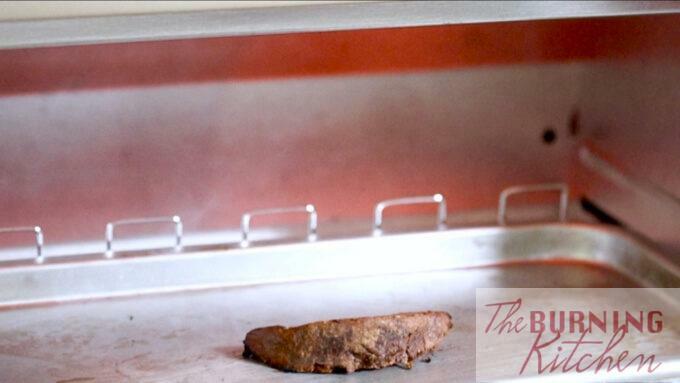 While frying use a spatula to press on heads to extract juices. Next, add the prawn water and boil for 10 minutes. Sieve stock and discard shells. In a wok, heat up 250 ml of oil, then fry rempah for 30 minutes over low heat until aromatic. Add in the ground dried shrimp and continue to fry until fragrant. 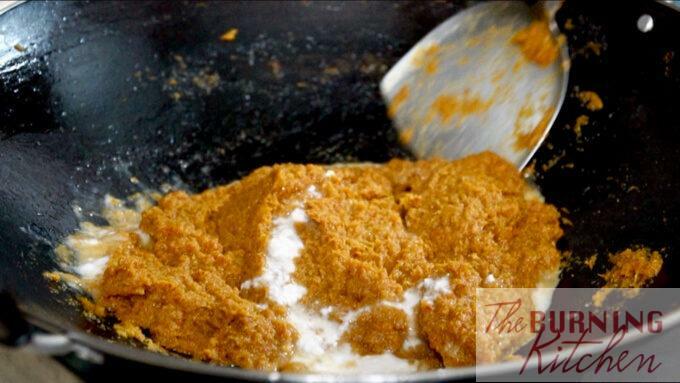 While frying, add in 4 tbsp of the coconut milk a little at a time. Next, add in the prawn stock and bring to a boil over medium low heat, then transfer to a pot. Add in the laksa stalks and boil for 20 mins stirring constantly, then discard stalks. 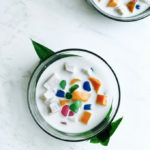 Add salt to taste.Then, add in the coconut milk and tau pok and boil over low heat for another 5 mins, stirring constantly to prevent gravy from getting burnt. Do not cover the pot, and do not bring to a boil otherwise the gravy will curdle. When the gravy starts to bubble, turn off the heat immediately. Pour hot water over cockles for 10 seconds then drain dry. 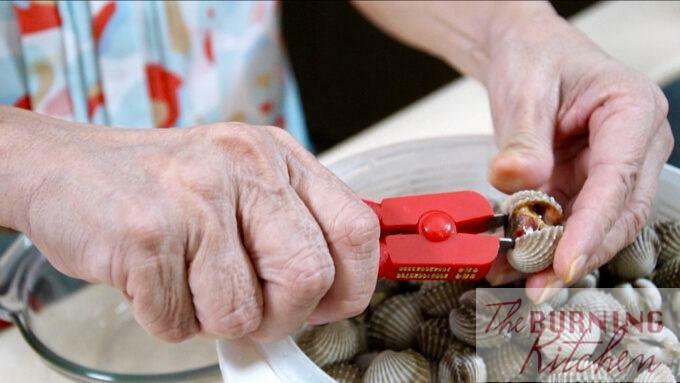 Remove the cockles from the shells and refrigerate. Peel and slice the hard boiled eggs into half. Cut the fried fish cake into strips. If you buy fresh fish cake, you need to deep-fry it until light golden first. 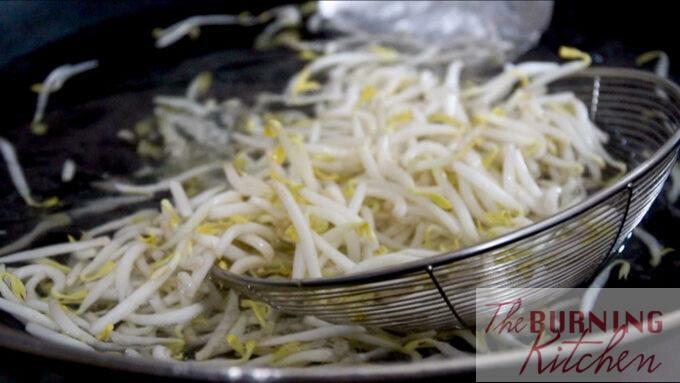 In a wok, add the bean sprouts to 1 litre of room temperature water. Bring to a boil for about 2-3 minutes, then immediately sieve out the bean sprouts. 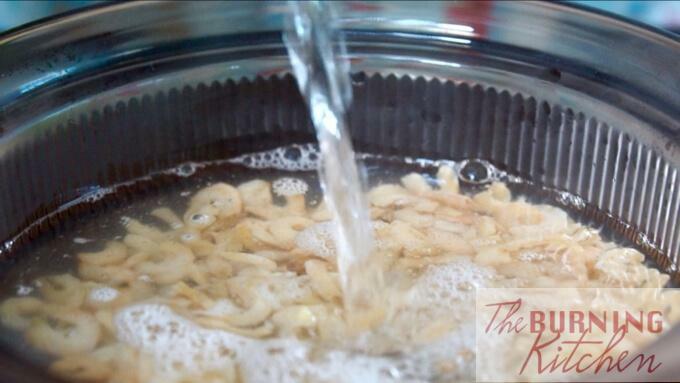 When ready to serve, bring the water to a boil again, then blanch the thick bee hoon for 1-2 minutes. 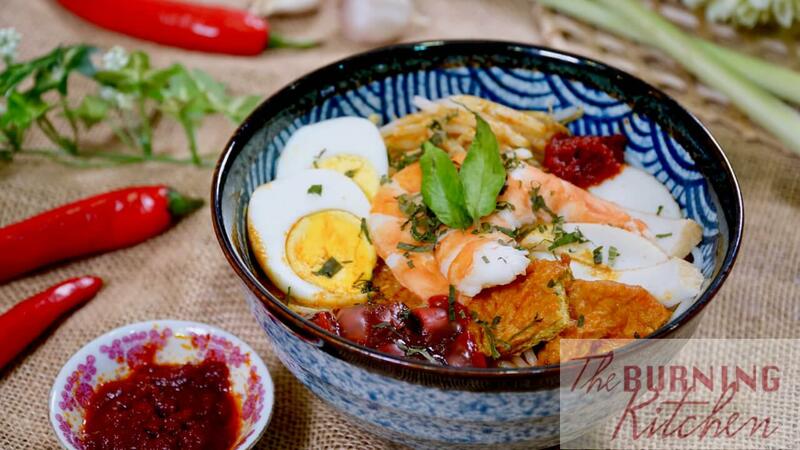 In individual bowls, add the bee hoon, bean sprouts, cockles, tau pok, fish cake slices, and 1/2 a hard boiled egg and pour the hot laksa gravy over it. 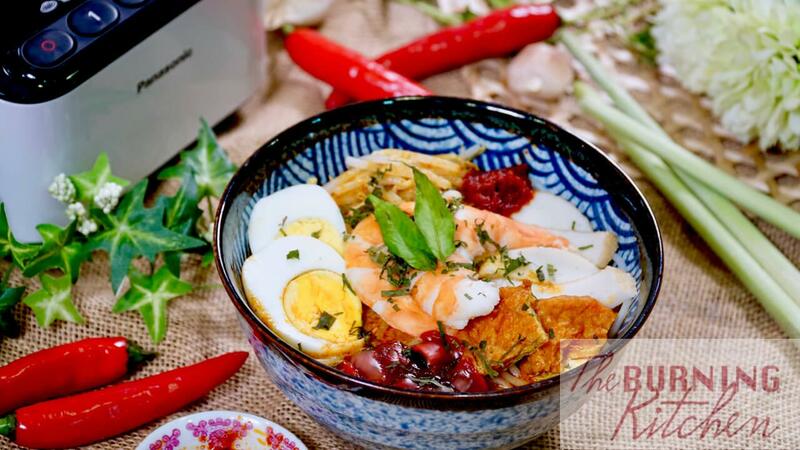 Top up with laksa leaves and serve with sambal. 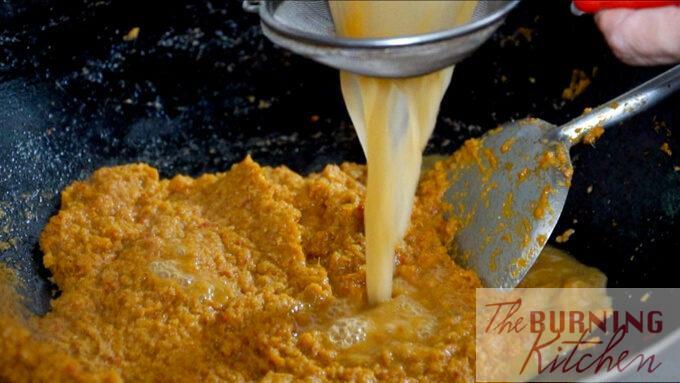 Fry rempah over low fire and slowly fry till aromatic, as rempah can get burnt easily. Use tap water to cook beansprouts, not boiling water. This is so they will remain crunchy and not limp. Use fresh vermicelli for best results as it is softer and smoother compared to dried versions. Blanch cockles briefly to make them easy to open, but not too long that cockles become rubbery. 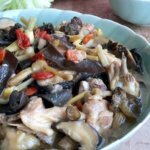 Instead of using ready-made fish cakes, you can buy fresh fish cakes from wet market (look for stalls selling raw yong tau foo) and fry them yourself. Constantly stir gravy to prevent it from getting burnt, especially at the bottom. Do not cover pot. Rempah can be prepared a day before. You can also make extra portions to freeze for another time. Laksa takes a lot of patience but the results are very satisfying! Another stalwart of Singapore's hawker legacy, Singapore-style laksa is so ‘lemak’ and goes especially well with fresh cockles and sambal chilli. Shiok ah! 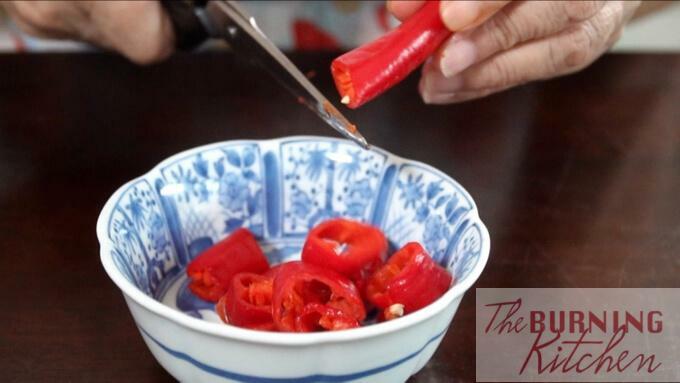 De-seed the red chilli and cut into small pieces and set aside. De-seed the dried chilli and cut into small pieces. Soak in hot water until soft. Toast a small piece of belachan and set aside. 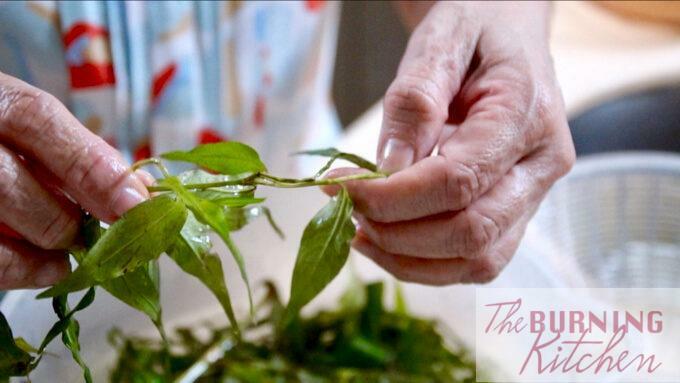 Rinse the laksa leaves and remove the leaves from the stalk. Cut the leaves into very fine strips. Keep the stalk for the gravy. Remove the roots from the bean sprouts. Rinse and drain. 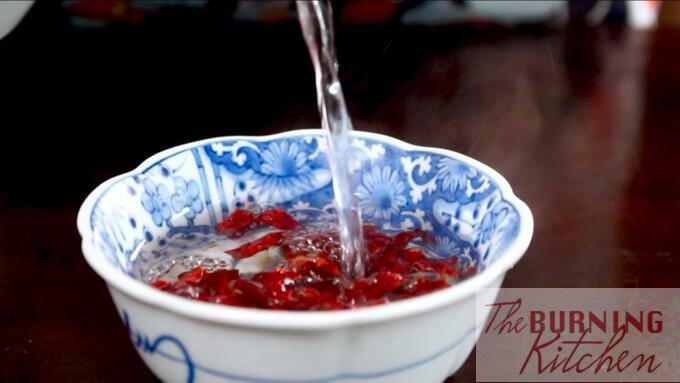 Wash the tau pok and squeeze dry. Cut into 4 pieces. Place cockles in a basin filled with water and 1/2 tsp of salt. 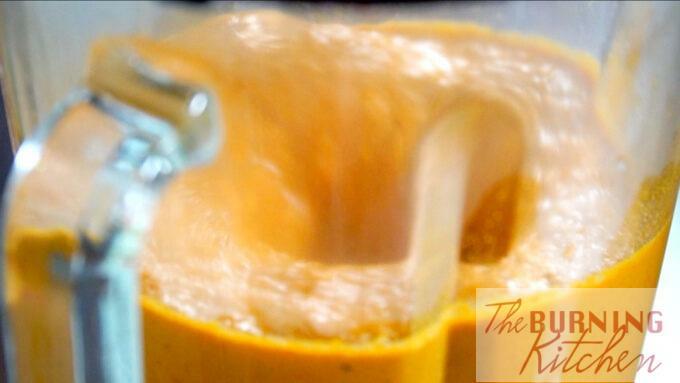 Soak for 30 minutes to purge impurities. Discard water and wash cockles a few times to remove mud until water runs clear. Wash the prawns and set aside. 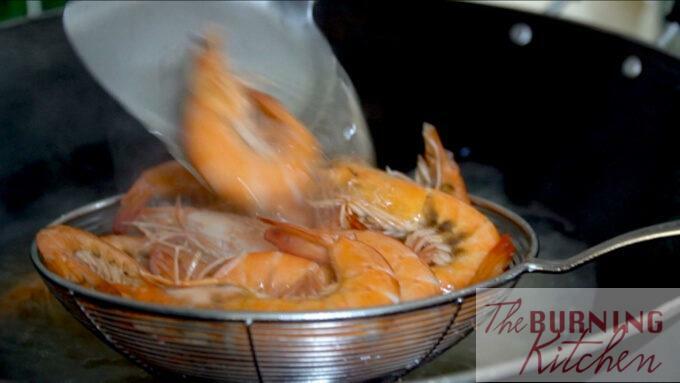 Place the rempah ingredients and shrimp water into the blender and blend finely. Transfer to a bowl. 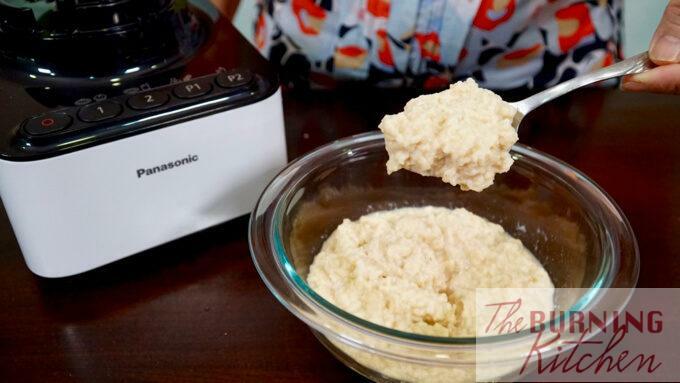 In the same blender, blend the dried shrimp finely and transfer to a bowl. 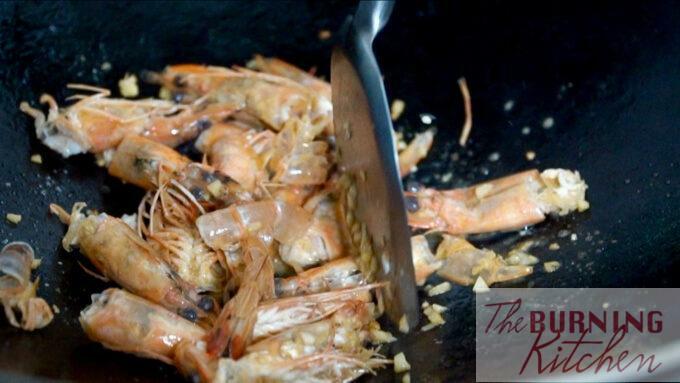 Boil 500 ml of water, then cook the prawns over high heat for a few minutes until prawns turn red and "U" shaped. Remove the prawns, and keep the prawn stock. 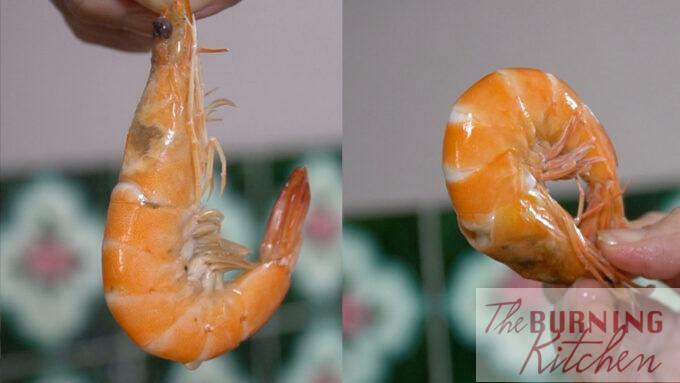 Peel the prawns and slice into half. 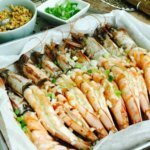 Set aside the prawn heads and shells for later use. In a wok, heat up 1 tbsp of oil. Add the chopped garlic and fry until aromatic. 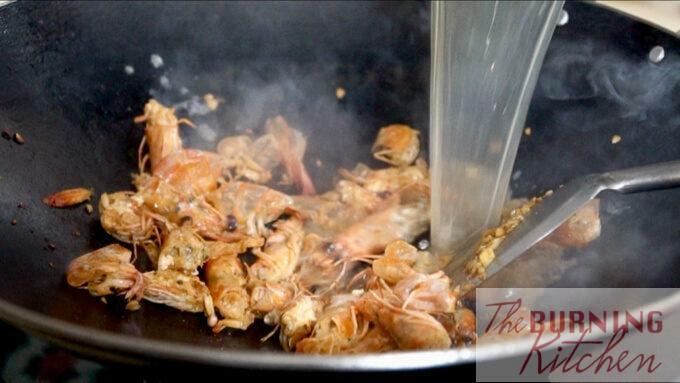 Then add the prawn heads and shells and fry until aromatic. 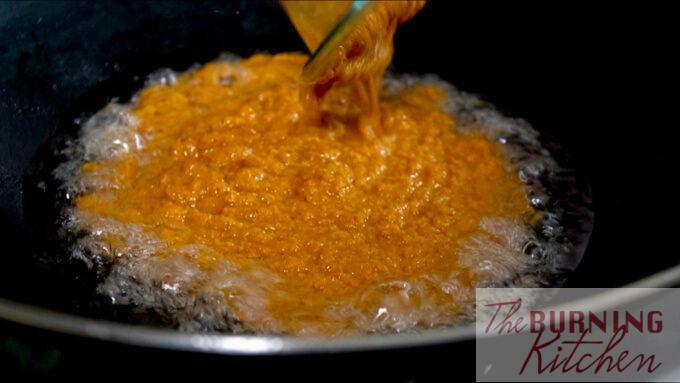 While frying, use a spatula to press on heads to extract juices. Next, add the prawn stock and boil for 10 minutes. Sieve stock and discard shells. In a wok, heat up 250 ml of oil, then fry rempah for 30 minutes over low heat until aromatic. Add in the ground dried shrimp and continue to fry until fragrant. 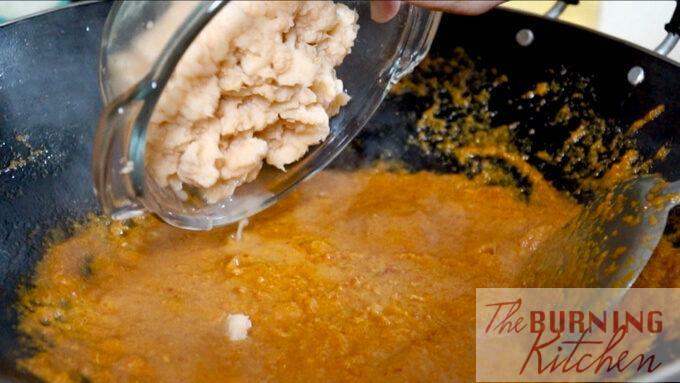 While frying, add in 4 tbsp of the coconut milk a little at a time. Next, add in the prawn stock and bring to a boil over medium low heat. Then transfer to a pot. Add in the laksa stalks and boil for 20 mins stirring constantly, then discard stalks. Add salt to taste. Then, add in the coconut milk and tau pok and boil over low heat for another 5 mins, stirring constantly to prevent the gravy from getting burnt. Do not cover the pot. Pour hot water over the cockles for 10 seconds then drain dry. 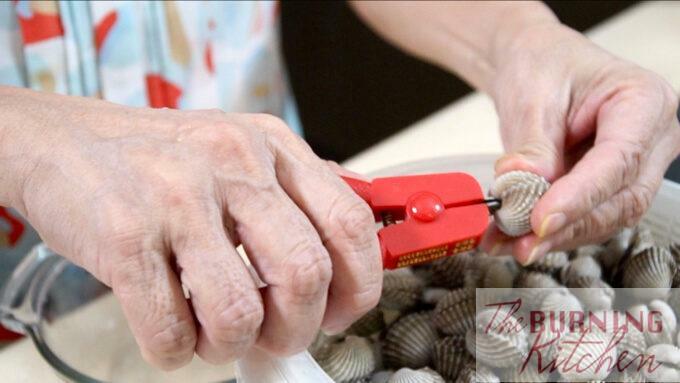 Remove the cockles from the shells and refrigerate. Peel and slice the hard boiled eggs into half. 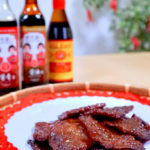 Cut the fried fish cake into strips. If you buy fresh fish cake, you need to deep-fry it until light golden first. In a wok, add the bean sprouts to 1 litre of room temperature water. Bring to a boil for about 2-3 minutes, then immediately sieve out the bean sprouts. 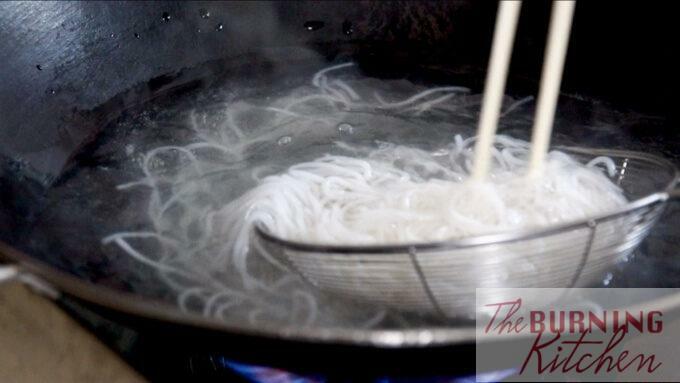 When ready to serve, bring the water to a boil again, then blanch the thick bee hoon for 1-2 minutes. 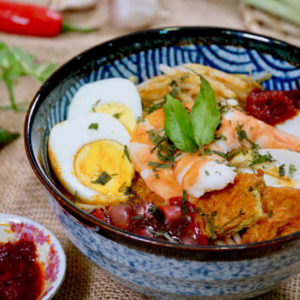 In individual bowls, add the bee hoon, bean sprouts, cockles, tau pok, fish cake slices, and half a hard boiled egg and pour the hot laksa gravy over it. 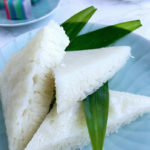 Top up with laksa leaves and serve with sambal. Use tap water, not boiling water, to cook beansprouts so they will remain crunchy and not limp.